Time Management Techniques, two fantastic tools! Time Management techniques for the artist. Whatever your goals are as an artist, (whether it be to earn a living, or sharing your passion with your family and friends, or both) there will come a time when you will need to manage your time with it. When I speak of time management techniques, I’m talking primarily about how you are organized to give the minimum effort to get the maximum result. 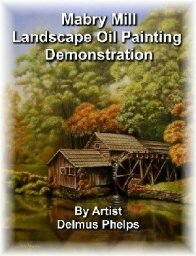 All through this website, I’ve given tid-bits of info on how to accomplish some of this in the studio, and within the practice of your painting craft. This article will focus on giving you some larger reaching tools in order to schedule in that block of time for yourself and your art! Have you ever felt frustrated when thinking about what you should be doing next? Have you missed appointments, been late to an event, or forgot that friends’ birthday? Sure you have, we all have. You may feel like at times you are overwhelmed with all the “stuff” you gotta do! You are not alone! So many folks have crossed this path that there now is a multimillion dollar industry out there to help you schedule your time with new time management techniques. Allow me just a little more of your time to give you what I have found to be some very effective tools in this arena. What are my qualifications you ask? Besides being the husband to this worlds greatest woman, and the father to 7 rug rats, well, they’re a little larger than rug rats now, working in industry, climbing that corporate ladder of success, a scout leader, active member of our church, slow-pitch softball pitcher (with a curve ball), gardener, mechanic, carpenter, motorcycle enthusiast, 4.0 ranked tennis player, and now daily dog walker, I still found time to pursue my passion for painting! So here are some of my time management techniques that I have used to keep myself sane, and not miss the big events in life. You see, time management is just another way of saying scheduling, but not in the old sense of the word. You see, scheduling (in the old sense) could be too restrictive and binding, and could actually bring more stress then it relieved. We're not talking about writing down a to-do list either, that's just part of a true planning system. No, the new scheduling and time management I’m referring to is discussed in great detail in Stephen Covey’s book entitled “The Seven Habits of Highly Effective People”. Now it’s extremely difficult to pull together in a paragraph or less what an entire book develops, but suffice to say, read the book! It will help you immensely in determining what your true values are and by what principles drive your life. Without these, you’re like a ship on the open sea without a rudder. Being tossed about by one wave of events after another, never being fully prepared for the big waves that crash down on us on occasion. You see, once you understand what you truly value, what's really deep down important in your life, only then can you really develop concrete goals. Goals that won't change every time those waves do crash onto your parade. Synergize, principles in creative cooperation. Sharpening the Saw, Balanced self renewal. Understanding these seven habits will help you motor through those occasional waves like a surfer on his board pushing out to catch the big one, and having to pull through a few small to medium waves(LIFE)! Better yet, get the book on audio CD and listen to them when commuting to your job! That is how I "read" it the first time. See that picture above, yup, that's my kitchen table/office. I brought my laptop up from the office to discuss the weeks plans and get some help from my daughter on editing this page! 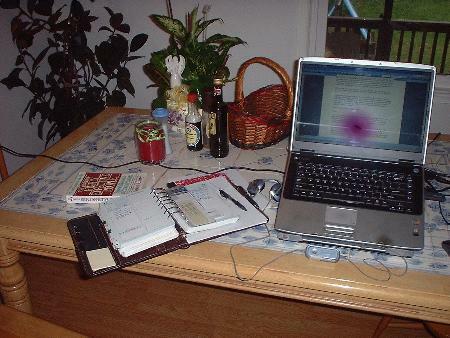 Take note of the book/journal/planner on the left of the lap top. I talk about it next with my second most important time management techniques. 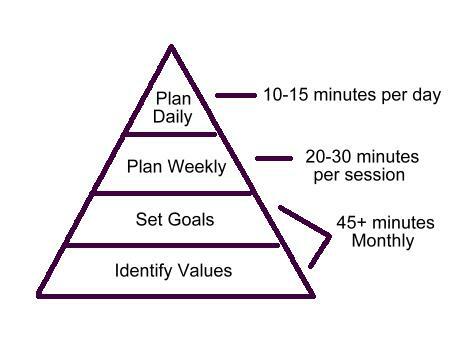 Get a planning tool. My recommendation is the Franklin Planner. Being in industry, I was fortunate enough to go to one of their training seminars. They were pricey way back when, but they may not be so bad today. Check their website <link> as there simply is no better tool on the market (and I’ve tried half a dozen, but keep coming back to the Franklin). 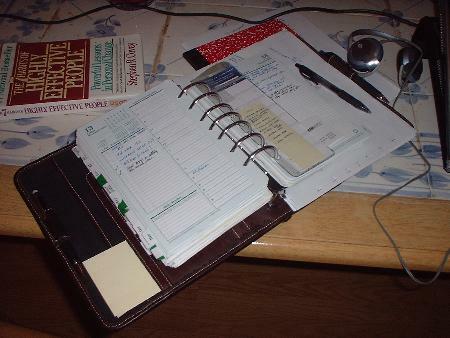 I actually went a full year with another cheaper brand, and at the end of the year, went back to find some information, and, well, you see on my kitchen table exactly what I use today, The Franklin Planner system! I receive no commission on this, the link opens in a new window and the page is for their bundled packages (best value) to getting started with them. Better yet, register for one of their live one-day seminars, and the initial planning system (about $50) is included. You'll have to visit their site to see when and where they are available. They also have a money-back guarantee! What does a Franklin Planner do for you? They help you establish what you value most, setting goals, (see my mind mapping article). Planning by the week and daily planning. The planning kit/or seminar, will walk you through how to use the system. This doesn’t take a great deal of your time. My weekly planning sessions are a lot of fun! They simply consist with my wife on a Sunday afternoon, over coffee and a piece of cheese cake, or a football game on the t.v., just to make sure I don’t miss those things that she or the kids have going on in the coming week. It works in that once you've established what is most important to you, you'll think on those things as you perform your weekly planning session. In this way, you fill up your time slots with the most important items first. You then fill in the remainder time with smaller, less important items, but items that need doing none the less. So there you have it, my two most powerful tools I use in filling up my bucket of time to the brim! and not missing much! Thanks for bearing with me this long, and utilizing your valuable time in such a productive way learning about my time management techniques!